Before you post a "Bug" in AES or you have problems with any of the features, please read the post below first, many of the know issues will be explained here. When you see a problem post of any user in this forum, where a solution is explained here, please just post a link to the related post, so the user can find the text here. This is a bug in the API of the ACC-Pack, which is corrected in the public SP2, so only user with ACC-Pack have this issue. In this case, click with the mouse the lower boarder of the transparent window and enlarge the size by pulling down the window, until you see all the lines. 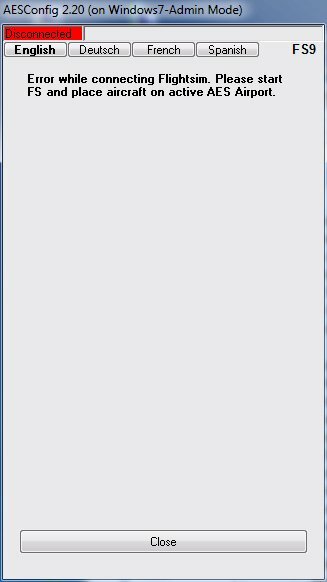 Normally the FSX will keep this size until you restart the FSX. When you click on "Set Aircraft Parameters" or "Configuration" in AESHelp, AESConfig is starting. When you don't have a green "Local" in the upper left corner, AESConfig could not connect. When you use Window 7, it is important to start AESConfig in the same Mode (Admin/Normal) as the FS is started, otherwise Windows will block the communication. 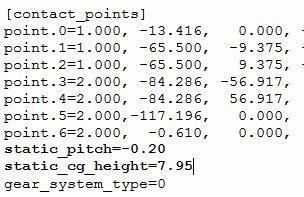 When you make the pushback and the aircraft is jumping or generate a crash, the "static_cg_height" and "static_pitch" values in the aircraft.cfg of the aircraft is not set optimal. Place the aircraft at an AES activated airport and start AEShelp/AESConfig. At the "Set Aircraft Parameters" page, you find the "Repair for Push" Button. Press this button once, then save and exit the config. 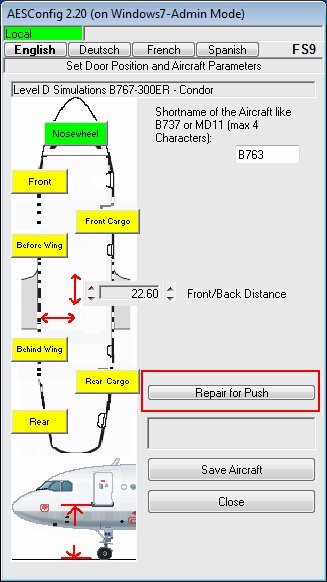 Reselect the Aircraft in the FS to reload the aircaftconfig and try the push again. Then place the aircraft somewhere in the FS and switch to the "Slew" Mode (default key Y) and back to normal, and you will see that the aircraft will move up and down or change his pitch, when you switch between Slew and Normal. Now, try to change the "static_cg_height" Value in small step's (+- 0.10), save the CFG file, reselect the aircraft in the FS (to reload the new cfg) and check the switch Slew/Normal again. If the aircraft changing the pitch, try the same with "static_pitch"
When the aircraft is not anymore moving while the switch over between Slew and Normal mode, the push will work without jumps and crashes. When you use the FS with setting AUTOGEN = NONE (off), it could happen, that at some sceneries objects are missing and not display, maybe only if you fly into an airport. This can not only happen with Aerosoft products! For AES it could happen, that AES is not active at the airport, even when the airport is activated in AESHelp. When AUTOGEN is ON (Spare or higher) all is fine. This is generated by an FS internal optimize process. Some sceneries use special codeparts to protect the autogen around the airports to be removed, but this code will have a sideeffect by setting Autogen=NONE, so that the FS will ignore that code under this conditions. At the moment it is not clear, if there is a solution to get a fix for Autogen=NONE. Please set the Autogen to Spare or more, related to the speed of you PC to prevent problems here. Please place your aircraft at a AES controlled Airport and start AEShelp/AESConfig, press the Configuration and check the volume of the sound's. If the sound don't come back at maximum, set the Checkbox "Maximum" behind the annoucement slider, then you should hear the sounds. 6.) AESHelp will not find the Airport Addons as "Installed"
Allways check first, if you can see the Airportaddon in the FS, as long as the addon is not shown correct and you see only the default Airport or only parts of the Addon, correct this first, before you try AESHelp. AEShelp will detect addons only by looking in the scenery.cfg for Active entries and search for special BGL files to find in the related Scenery Pathes. If this BGLs are not found, AEShelp will report the Airport as not Installed. When you have installed the FS9 to it's default directory below c:\Program files on a Windows Vista or Windows 7 OS, the UAC (User Access Controll) is active, then it could happen, that the Scenery.cfg of the FS9 is not changed in the original position in the mainfolder of the FS9. In this case Windows makes a copy into the "Virtual Store" to prevent overwriting the original file. AESHelp will report this condition, when it is started and you can correct this. 7.) Why can I only order one Creditpack in the Shop (Aerosoft/Simmarket)? This is a limitation of the Shopsystem, because it is only designed to order one copy of the same Download-Product in one order (which is the usual process for all other Aircafts, Sceneries or Tools, nobody needs them twice). The Shop can assign and store in the History only one Serialnumber for a product in the same order. So you must make seperate orders, when you what to buy more then one creditpack. Is not nice, but could not be changed for only one Product, where this could happen. Sorry.